The key to a healthy, happy and productive life is what happens between the sheets—meaning sleep, of course. But in our 24/7 wired culture, consistently getting seven or eight solid hours of ZZZs is, for many of us, an elusive dream. The Centers for Disease Control and Prevention declared sleep deprivation a public health epidemic in 2011, noting that between 50 and 70 million Americans suffer from chronic sleep problems. Sleeplessness, according to the CDC, is linked to everything from car crashes and industrial accidents to chronic diseases such as hypertension, diabetes, cancer, obesity and depression. “We need to prioritize sleep as a health imperative,” says Mark Brown, M.D., founder of Great Hills ENT in Austin, Texas, and author of Smarter Sleep. The key to restorative slumber is making small modifications to your habits throughout the day, investing in your nightly shut-eye for the long run and knowing when your sleep troubles may be something more serious. Everyone knows the fundamentals of achieving quality sleep: keeping the bedroom dark, quiet and cool. But a stack of new research shows there are daily tweaks you can make to optimize sleep. Look beyond the basics to what neuroscientist Christopher Colwell, director of the University of California, Los Angeles Laboratory of Circadian and Sleep Medicine, calls “good circadian hygiene.” That means aligning your behavior with your body’s circadian clock, or built-in timer. • Restrict eating to a 12-hour cycle. “Our bodies are designed to take in calories over 12 hours and fast for 12,” Colwell says. Research at the Salk Institute for Biological Studies in La Jolla, California, showed that disrupting this natural order by, say, snacking at 2 a.m., leads to poor sleep, weight gain and the kind of metabolic disorders seen in people with diabetes. New research completed at Colwell’s lab suggests mistimed eating can also impair memory and learning. • Don’t stay in the dark about lighting. 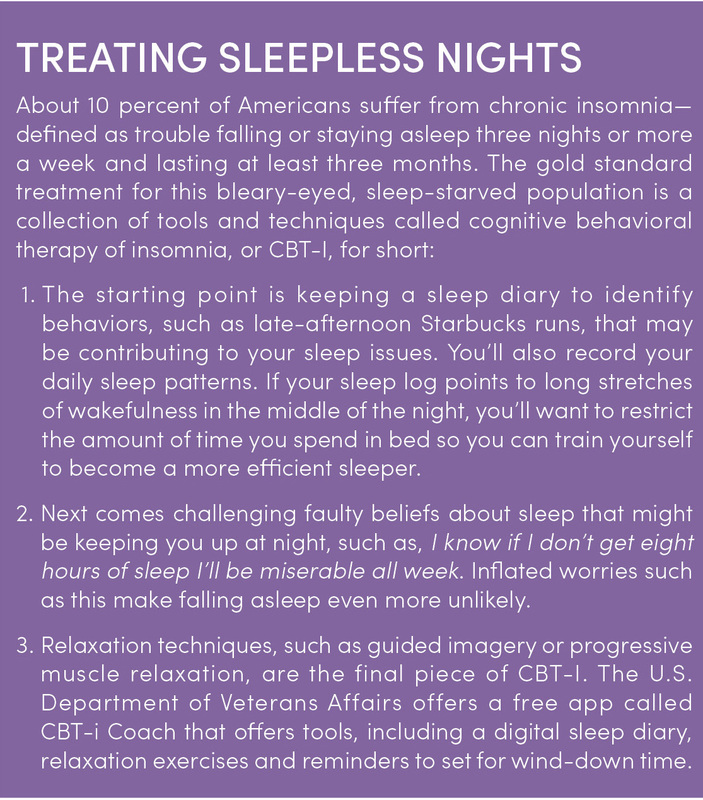 “Light is the biggest anchor for sleep,” says Colleen Ehrnstrom, Ph.D., a clinical psychologist with the Department of Veterans Affairs in Denver and co-author of the book End the Insomnia Struggle (October 2016). Just as the light of dawn awakens us, the dimming of light cues our bodies to produce melatonin, the sleep-inducing hormone. The blue light emitted by our electronics is especially disruptive, suppressing melatonin twice as much as other wavelengths of light. If you’re unwilling to banish technology at bedtime, you can mitigate its damage. For example, Apple’s newest operating system has the feature Night Shift, which will automatically shift your display to warmer hues at sunset. Or, you can install an app that filters blue light, such as f.lux or Twilight. Covering your screens with an orange filter will also reduce your exposure to blue light. • Skip the 9 p.m. workout. A post-dinner stroll with Rover is fine, but don’t schedule a strenuous gym session within three hours of your bedtime. “Our core body temperature falls when we’re ready to go to sleep, and since an intense workout raises your body temperature, that can upset your circadian clock,” Colwell says. • Keep the same schedule. It may be difficult to give up sleeping in on weekends, but inconsistent sleep patterns can make it harder to reach deep slumber. Studies show you’re also likely to put on a few extra pounds. • Have a bedtime ritual. Unfortunately, our brains don’t come with a power-off switch. “Our mind requires a little time to quiet itself,” says UCLA neuroscience researcher Alex Korb, Ph.D., author of The Upward Spiral. Try to do something restful a few minutes before you hit the hay; jot down three things you’re grateful for, do a few yoga poses or sip a cup of chamomile tea. A 20- to 30-minute daytime siesta can be an effective way to recharge and boost alertness. But keep it short and schedule it for early afternoon—between 1 and 2 p.m., says Colwell. Later or longer than that and you’re likely to wake up groggy and ruin your nighttime sleep. Sleep apnea is a stealthy thief that robs people of healthy slumber and puts them at risk for everything from depression and sexual dysfunction to heart attack and stroke. In sleep apnea, the tissues in the back of the throat collapse, blocking airflow and causing pauses in breathing. Some people may experience these apneas hundreds of times a night. Recent research published in the journal Neurology found that untreated sleep apnea may contribute to earlier mental decline—and perhaps even Alzheimer’s—in elderly people. For mild sleep apnea, losing weight, drinking less and using special pillows may be treatment enough. Mouthpieces or masks that keep the airwaves open are often prescribed for moderate or severe apnea. Shopping for a new mattress—a necessity every eight to 10 years—can be stressful. Michael Breus, Ph.D., a sleep specialist in Manhattan Beach, California, and author of The Sleep Doctor’s Diet Plan, has two words of advice: lie down. You’ll also want to swap out your pillows every 18 months to make sure they have the support you need, Breus says. The purpose of a pillow is to align your cervical spine so there’s no bend or tension in your neck. Side sleepers will want a firm pillow thick enough to fill the space between the ear and shoulder; back and stomach sleepers will want a thinner pillow that cradles the neck at a natural angle. Suffer from back or neck pain? Try a contoured pillow. Lights out and sweet dreams!